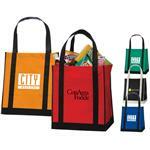 The Zippin Foldable Tote Bag - a compact and functional shopping tote. Easily folds up and zippers into a slim 7.5" x 4" pouch (all one piece)! Folding Durable Eco Friendly 80 GSM Polypropylene tote bag includes metal keychain ring attached to zipper and a front open pocket. 22" handles. The Zippin Tote Non-woven Poly is 100% recyclable and made of 40% pre-consumer recycled contents and 60% post-consumer recycled contents. FREE 1-DAY RUSH PROMOTIONAL ITEM! 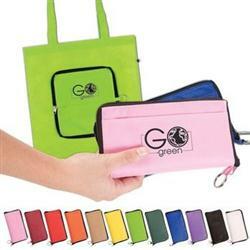 Available Colors: Red, Black, Lime Green, Khaki, Pink, Burgundy, Orange, Yellow, Hunter Green, Reflex Blue, Purple, White. Available Imprint Options: Screen Print (One-Color Only). 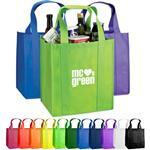 80 GSM Non Woven PolyPropylene Material - made with recycled material and recyclable. 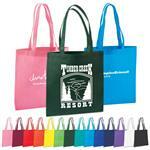 Foldable tote bag. 13 pounds per 100 pieces.